What a week! 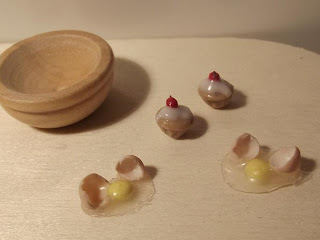 Too much happening, with not enough time or energy to sort everything out... in fact, the only crafty thing I've done is make some 1:12th scale broken eggs from the eggshells I made recently. I didn't put my usual penny in the photograph to show scale, as you've already seen th eeggshells and cupcakes next to the small coin (and yes, it really is the same coin each time!). Un fantastico trabajo, muy real. You do fantastic work...they look real!